The next decade will see more people and constrained resources but better connectivity and a shift in economic power to Asia. How will this affect the world we live in? What are the other big issues for the next decade? These are concerns that individuals, companies and governments need to address. 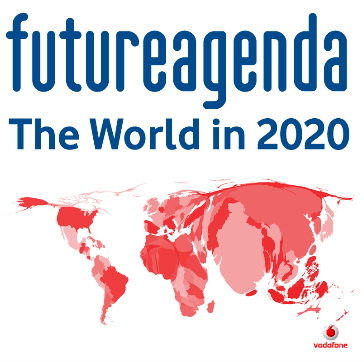 The Future Agenda programme, sponsored by Vodafone Group, is a pioneering open foresight project that has brought together informed people from around the world to analyse the crucial themes of the next ten years. This website details the output from multiple discussions. Fifty workshops in twenty-five locations have created a unique view of the next ten years. At a time where important decisions need to be made across many areas, it provides a distinctive perspective to stimulate ideas and action. The Future Agenda programme kicked off sixteen parallel discussions. As views on these were shared and built upon, it became clear that as well as the vertical conversations within each topic, there were a host of issues bubbling to the surface that cut across several areas. Some of these are critical drivers of the future; some are issues that will moderate how the future unfolds. As such, in the synthesis of the insights from the programme, we have sought to highlight these issues and group them accordingly so that you, the reader, can see how they interrelate, and can therefore also choose which chapters of the book you will find most interesting. In the opening section, we detail what we see as the four macro-scale certainties for the next decade - the things that, unless there is an unexpected, massive and fundamental global shift, will most definitely occur and so are the certitudes upon which everything else is built. These certainties are 1) a continued imbalance in population growth, 2) more key resource constraints, 3) an accelerating eastward shift of economic power to Asia, and 4) pervasive global connectivity. Each of these is covered separately so that you can gain a good understanding of why these macro drivers of change are occurring, what the core characteristics of these shifts are and, therefore, how they will influence the world between today and 2020. The second section explores some of the key insights we have gained into how the world and our lives will probably change over the next decade. These are the key changes highlighted by the programme that will occur in many different areas, some influenced by just one of the four certainties, others by two or more. These changes are detailed by providing both the signals from today that give evidence to support the direction of change and the future implications over the next ten years. They are grouped into six clusters - health, wealth, happiness, mobility, security and locality - which seem to encompass all the issues highlighted. Each change that is depicted in this section is variously linked to a number of others and so we have used margin indicators to help you see these links clearly and so move from one topic to another. This navigation replicates in a somewhat limited printed form some of the more dynamic interactions that can be found between these topics on the accompanying website. Finally, there is a section giving resources and references which brings together some of the multiple sources of information that have been shared and used in the Future Agenda programme. We will continue to add to this as the programme develops. A short video message from Vittorio Colao, Vodafone's CEO. A message about the Future Agenda programme from Vittorio Colao, CEO Vodafone Group. The Future Agenda began with a number of questions and a rough idea of how to answer them. We wanted to provide a forum for discussion of the most significant challenges we face as a society over the next ten years and think about ways in which collectively we can address them. An international team has worked together to deliver, design and synthesise output from workshops, on-line discussions and additional dialogues from around the world. The Future Agenda programme is the world’s first ‘open foresight’ initiative and has united some of the best minds from around the globe to address the greatest challenges of the next decade. What we see as the four macro-certainties for the next decade: a continued Imbalance Population Growth; more Key Resource Constraints; an accelerating Asia Wealth Shift; and Universal Data Access. The world of health and nutrition is one which will experience many significant technological and social changes over the next ten years. We have chosen eight insights which were felt to be the most significant probably changes in this area. The next decade will see new technologies that will drive new business models that will in turn change how wealth is created and shared. It will also see political and social needs drive other changes in how we manage and use the wealth we have available. We have chosen eight insights which stimulated the most debate some which will have global relevance and other will have a very local impact. At one extreme, happiness is about societal change, demographic shifts and so on; at another there are very personal issue around choice and enjoying the life we have. These eight insights highlight the fact that, on balance, the world in 2020 could be a happier place. There is little doubt over the next decade there will be increased mobility. People and things overall will be mobbing round the globe further and faster. Expect China to play a huge role in this area. Transportation trends change slowly but these eight insights cover the areas which we believe will have the greatest impact in the next decade. Given the increasing ease of communication and connectivity, more people on the planet and the certainty of key resource constraints issues around security are expected to grow. The eight probable futures in this section cover food security, health security, energy security and water security. The next decade will see more of us living in cities so locality and how we live together will become increasingly important. The environments in which we live will take time to change but we have identified eight areas where change is possible within the next ten years. A series of films highlighting solutions to some of the key challenges for 2020 developed by IDE students from the Royal College Art as part of the Future Agenda project. This section draws some conclusions and raises a series of key considerations for governments, organisations and individuals. It was always intended that the insights presented here should act as stepping-stones to additional activity. We want to encourage people to think about the 'so what?' in order to help companies, governments and individuals build strategies to prepare for the future. This is why we decided to make the information we collated as widely available as possible so that everyone could have immediate access and use it to stimulate their thinking.